Bag loads of Cascade and Galaxy whole hop flowers that we source direct from hop growers in Victoria, Tassie and the US are thrown at this beer, creating an intense citrus and grapefruit aroma and flavour that we balance with a careful selection of specialty malts and a local pale malt made to our own specifications. Preservative and additive free, our Pale Ale is live-yeast conditioned in bottles and kegs for unmatched freshness and character. This is a top quality beer widely distributed in Australia. What is great about it is that it is smooth and has a golden malt flavour.Its aroma is a mix of bread and apple notes. It has a vibe of plum-nectarine with citrus and its fruity hops balances with malt and yeast. The balance is great and it is very tasty. 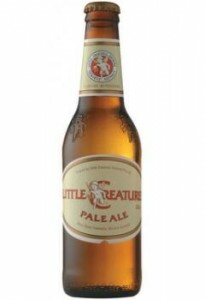 Little Creatures Pale Ale is highly recommended.